“Before & After” pics of their tile! Grout Shield, over the years has received an incredible number of “before and after” photo’s from our increasingly large number of satisfied customers. Given the contrast between each set of photos it isn’t difficult to imagine them being compelled to email them to us. The difference in overall appearance of the floors, counter tops, back splashes, tub enclosures, kitchen, and bathrooms we have seen has been quite striking indeed! 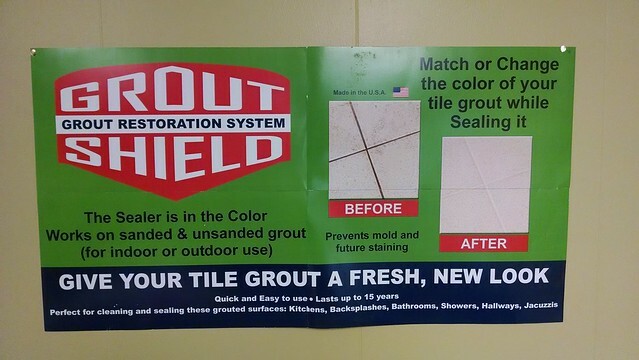 With this in mind we have decided to share some of these photos over the next few months, as time allows, as nothing can truly show the difference Grout Shield’s cleaners, colorants, sealers, and enhancers can make in the appearance of your tile. As you can see from this relatively small sample of pictures Grout Shields products can make an incredible impact on your home’s, office’s, or commercial area’s overall appearance. Safe, affordable, and easy to use, our colorants and sealers are a great first step for any do-it-yourselfers interested in sprucing up their tile. Grout Shield’s Products Set The Standard For Excellence In Grout Sealing And Maintenance! Grout Shield … industry leader in quality, service, and customer satisvation! We have a large number of other pics (literally hundreds and hundreds) that, as time allows, we will post here in the form of either photos, videos, or slideshows. Hopefully they will be of some use in demonstrating the utility and efficacy of Grout Shields products. Should you have any questions, concerns, or simply want to talk with someone about your specific project, please feel free to give us a call!